Our camp lies deep inside the "Protected Area", about 13 km from Rum Village. You cannot see the camp from the main track because it's hidden behind a large rock outcrop which protects it from the prevailing wind, and which also gives a superb view of the sunset. It's easily climbed and looks over the wide valley below. It's in a site that my family often used to camp at and I know that it's warmer than most of the camps that might have a great view from the camp itself, but which are completely unprotected from the wind. 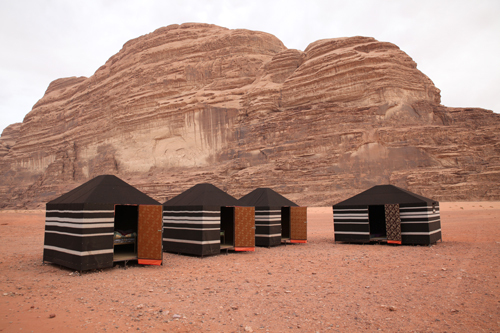 We have worked hard to make it both comfortable and a camp where any Bedouin feels at home. Our camp is close to Jebel Raka and is called Raka Camp (although most of the local people know it as "Attayak Ali's camp"). We have solar cells to supply electricity. This is rather limited but ample for electric light and to recharge your camera or telephone batteries. Please notice that we don't offer air conditioned tents or wifi! There is no phone connection in the desert but we can show you some places where you have a good chance to get connection (but not for internet). Others prefer to sleep right away from the camp on the dune a little bit to the right of the photo (right) which shelters the camp both from a southern wind and from observers. In the summer we take the mattresses and the stools into the sheltered square beneath the cliff and we make a fire there to cook dinner. In the winter the fire is moved into the main tent and a chimney is rigged to take away the smoke. When the doors and windows of this tent are closed it's very warm! The tent is big enough to party in it. 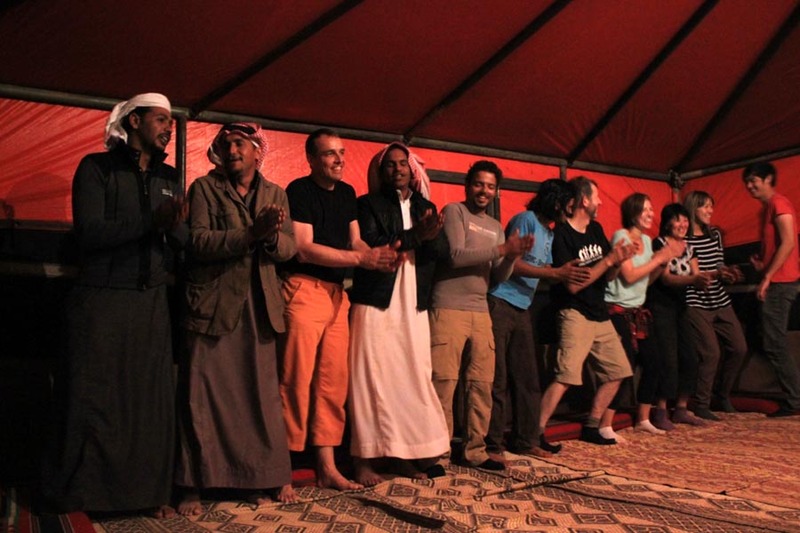 As you can see below you can have a lot of fun in the evening: everybody is learning the traditional Bedouin men's dance! Breakfast is bread or buns which we can warm on the fire and a choice of cheese, eggs etc. (whatever we see in the shops that looks good). 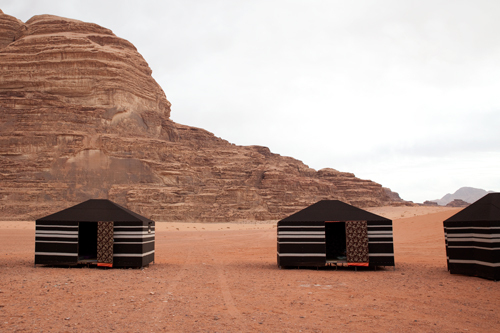 And of course we provide plenty of our Bedouin tea! We can also offer instant coffee for breakfast if you like. The kitchen is always clean and you are welcome to visit it if you wish. Sleeping equipment: We supply mattresses, blankets and pillows. In cold weather we have comforters which will keep you nice and warm. There is no real need for you to bring sleeping bags but some people prefer to use their own ones. 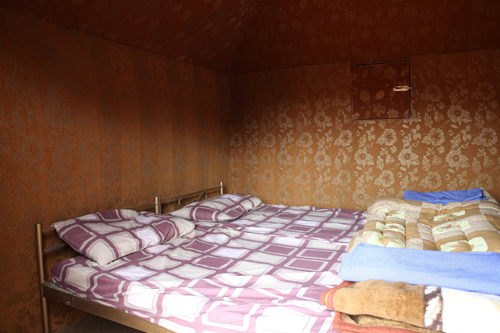 The sleeping cabins are insulated as much as we can and if you want extra blankets, you only need to ask for them. We recommend to have a jacket or sweater handy for the evening. Sometimes, in wintertime it can be pretty chilly at night. All our programs are described in detail on the website. They are usually based on two people doing the trip. We normally start out at 9.30 am and finish at about 4 pm, when we will bring you to the camp if you are sleeping here or back to the village if not. 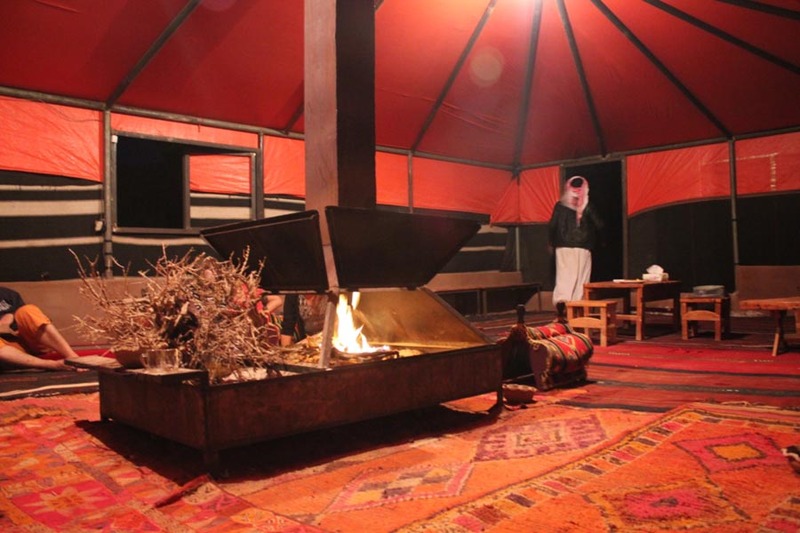 The camp is located pretty close to the famous Lawrence's House and on the valley leading to Jebel Burdah and the famous Arch, almost in the centre of the main tourist sights. 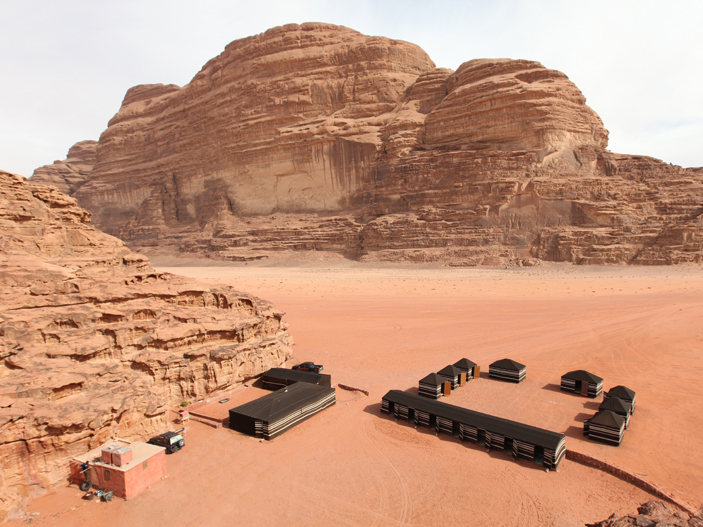 Although it gives on to a wide vista of valleys and mountains, the camp is protected on three sides by rocks and the fourth side by the dune between it and the main track. The camp is divided into two parts: The salon/dining room and the kitchen (the small red building on the left). They are both not far away from the sleeping tents. When the weather is warm the space in between the tents is arranged for sitting and many people bring their bedding out here to sleep. We have a big tent for eating, with either tables and stools or in the traditional way, seated on the ground. There are mattresses spread around for lying back and talking in the evening, of course with our Chai tea. If you want to party you can without disturbing others during their sleep due to the distance between the main tent and the others. Food: We offer a variety of dishes, based on local ones, ample in quantity and well cooked. In warm weather lunch is usually a salad dish with bread and some snacks. Supper is always hot. Vegetarian food can be supplied and if possible, please tell us about this or about any allergies before you arrive because there is no supermarket in the desert. Sleeping area: There are six small cabins, each with two beds, and two larger ones that can accommodate up to six people if a family wants a tent to itself. 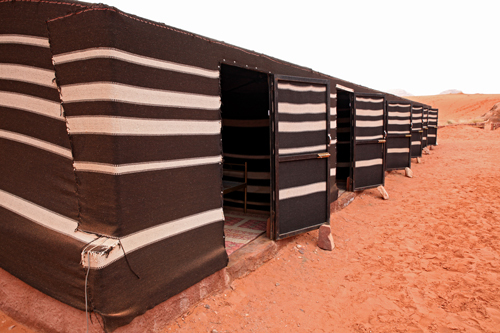 The long tent is divided into six by goat-hair hangings and each small room has its own entrance. This one is appreciated by larger parties. All of the cabins or "rooms" can be locked and you can keep the key of the padlock with you. Before you enjoy your dinner and the night in your tent, you can easily climb the rock on the western side of the camp where you find a splendid viewpoint for watching the beautiful sunset. In front of the camp, there is a low dune which is covered with tiny flowers in the spring if we have had enough rain during the winter. This shelters us from passers by and provides a great view of the wide valley below. It gives a great view of the sunset almost as good as from up on the rock behind it. The bathroom block is a little way from the camp. There are showers with cold and hot water, toilets and a tank outside for quick handwashing if the bathroom part is busy. The bathroom is cleaned every day. 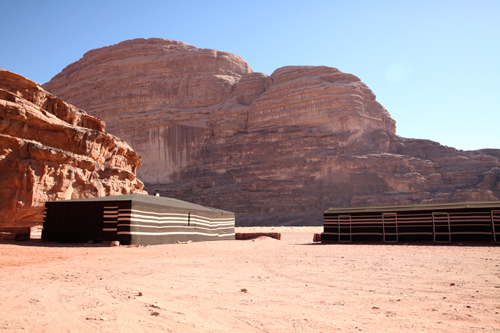 Do you like to sleep under the stars but still in a protected area? 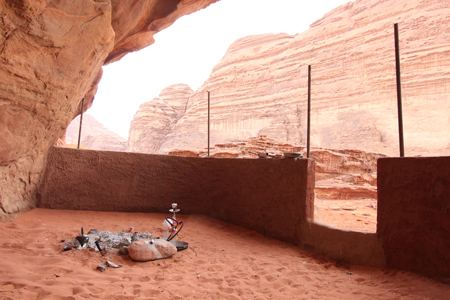 Then we can offer you our private cave with a fire place which is very close to our camp (just a 5 minutes walk). 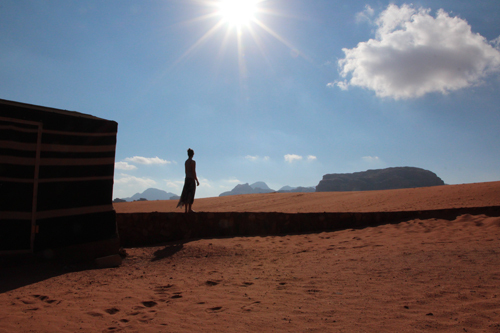 It's a great opportunity to join the silence in the desert! We provide mattresses, pillows and blankets for more comfort and you can still join breakfast and dinner at our camp. There is as well the possibility to arrange a private dinner for you as you can find at the program "Supper in the desert". Your name, your nationality and the number of people. The name of the program/s you would like to book. The dates you wish to come. 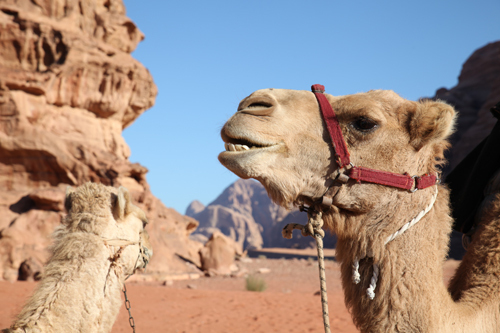 How you will get to Wadi Rum, from where and at what time you plan to arrive. If you need help with the transfer, just let us know. We can arrange a taxi for you if you like. If you will arrive with a rental car we can meet each other at the Rest House in Rum Village, after you passed the Visitor's Centre. We will repeat all these information in our answer to you and we kindly ask you for a short confirmation if you would like to book the tour as described. You can give us a quick call or SMS to confirm the booking as well. Our phone number is +962.795.899.723 (or 0795.899.723 from inside Jordan). Please read also the FAQs and Tour Conditions for further information!